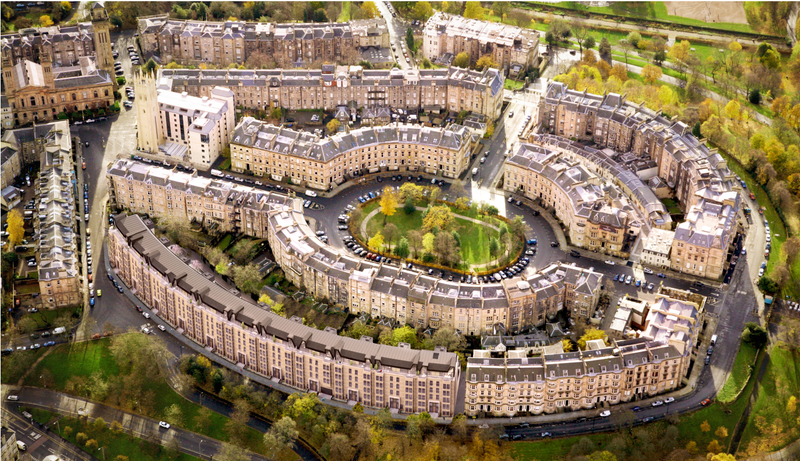 July 26, 2018 Samuel F.
Woolgar Hunter was appointed by Ambassador Group to deliver Park Quadrant in Glasgow's prestigious West End. The residential project involves the construction of 98 new homes complimenting the Victorian Architecture and completing the master piece of architecture originally envisaged by Charles Wilson in 1854. From the outset, the building's sympathetic architecture paid homage to the surrounding context set by Charles Wilson with 3m high ceilings, reinterpreted chimney stacks and a sensitive approach to fenestration. The 5 storey structure will be constructed using a steel slim-floor solution with a precast concrete floor system. Numerous options were investigated with a steel option being preferential due to it offering a quicker construction sequence than concrete. The rear garden podium has been designed to suit both the maintenance needs as well as providing a covered car park to the rear, respecting the views of local residents. The main building structure steps with the local topography and allows level access to the front and rear of the building. To enable the site Woolgar Hunter worked closely with Scottish Water to agree a sewer diversion, construction and access route through the site for future maintenance. Furthermore Woolgar Hunter incorporated a SuDS scheme into the project to help limit the run off from the site.